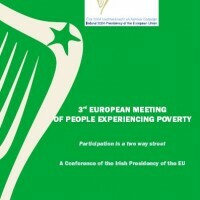 The topic chosen under the Irish Presidency reflected the demands that came out of the 2nd Meeting, and focused on dialogue between people experiencing poverty and policymakers under the title, “Participation is a two way street”. In a reversal of traditional roles, the “authorities” now became regarded as “guests” of the people experiencing poverty, and interfaced directly with the delegates in workshop discussions. The meeting concluded with an open forum between people experiencing poverty and a panel of policy-makers. A DVD made at the event will provide a tool for extensive use by the EAPN national networks to build awareness among national and regional policy makers.